This is an extremely important report for anyone who is concerned about treating AIDS or HIV infection. Photos of the five pages of this 1996 report which appeared in Surgical Overview, Surgical Technology International V, were sent to me by a very sharp scientist and humanitarian named Webster Kehr <jammstone@gmail.com> on November 18, 2006. Webster deserves real credit for finding this published report as much effort has been expended to suppress this Kaali and Lyman 1990 discovery at the Albert Einstein College of Medicine in New York City. For example, Dr. Bob Beck found that the text of the March 1991 Washington DC AIDS conference where Kalii and Lyman first presented their findings publicly, were razor cut out of library copies of the published journal. Bob was able to find only three brief news items immediately following the March AIDS conference in The Houston Post (Mar 20, 1991), Science News (Mar. 30, 1991 ) and Longevity magazine: and then nothing. The Discovery of the Century to address the greatest bio-engineered 'disease' in modern history, AIDS, was on the receiving end of one of biggest media blackouts ever to be perpetrated on the American public. How many people, to this day, still believe that AIDS is 'incurable'? About 99.999% of the public I would guess. To make the report readable, I had to enlarge Webster's photos using Photoshop so I could read it and then typed out the text of the report. I've inserted the graphs from the photos of the report into the typed version seen below. This report is a more refined presentation than that provided by Dr. Steven Kaali in his 1992 U.S. patent application (#5,139,684 Kaali & Schwolsky 8-18-92) which I posted to www.educate-yourself.org in January of 2000 (http://educate-yourself.org/be/bekaaliexperiment.shtml). This discovery by Kaali and Lyman in the Fall of 1990 was the centerpiece of Dr. Bob Beck's lectures on blood electrification. Kaali and Lyman re-discovered something that Dr. Robert O. Becker had also came upon in the 1970's and 80's in that direct current applied at very low voltage, delivered in the 50-100 microampere range effected amazing cellular response and achieved the de-activation of pathogenic organisms. Kaali and Lyman patented an invasive procedure to insert the DC micro currents. They opened up an artery and sewed in a tiny battery driven circuit with two tiny electrodes within the artery itself. After the battery ran out, they would remove it and insert a fresh unit in another artery location. After 5 or 6 months, the patient showed greatly lowered HIV viral loads and steadily recovered. Bob Beck, on the other hand, invented a non-invasive method of inducing the micro currents electro-magnetically by applying external electrodes to the wrists and used a bi-phasic square wave of 3.92Hz to achieve the same thing as Kaali and Lyman with their internal arrangement. Bob called it "blood electrification" and his unit is called a "blood electrifier" (you can make your own from instructions passed out freely by Bob Beck or get a factory made unit. Contact me for more information). An important consideration when applying DC (direct current) voltage to the body involves the physics of electrolysis. Dr. Robert O. Becker found that DC voltages higher than 1.1 volt caused sufficient electrolysis action that the body became overwhelmed and produced electrolysis 'waste' products in the region where the DC voltage was applied. Bob Beck got around the electrolysis problem by using an AC (alternating current) voltage in the form of a bi-phasic (two phase, positive and negative) square wave. However, Dr. Hulda Clark is adamantly opposed to using any application of negative voltage, whether as pure negative DC voltage or the negative half of an AC waveform (including the negative half cycle of a bi-phasic square wave). Hulda found that the slightest amount of negative voltage will encourage the growth of pathogenic organisms; something we're trying to avoid. For those who wish to experiment, you could insert a solid state diode rectifier in series on the "hot" side of the electrode wiring (the other electrode is at "ground" or zero potential) of the Beck electrifier and have the anode of the diode connect to the electrode itself. The diode rectifier will cut off the negative excursion of the Beck bi-phasic electrifier and leave you with only positive pulsing DC square waves. The square wave pulses are only "on" for 50% of each cycle and "off" for the remaining 50%. The 50% "off time" may prevent the electrolysis problem, but that's just a theoretical conjecture on my part. I haven't done any experiments to confirm this one way or the other. Another possible approach is to reduce the pulsing square wave down to a very narrow duty cycle pulse of say 20% . A third possibility is to switch over to a very sharp rise pulse. A possible downside in using a narrow pulse is that it might not deliver the requisite 50-100 microampere current desired, however, it might do it -if only momentarily. There's much food for thought here and an open invitation to anyone who can still think outside the Establishment box, to get busy and see what marvelous results you can obtain by following in the footsteps of both Dr. Robert C. Beck and Dr. Robert O. Becker. 1. "sup.2" refers to 'supra' (above) or raised to the power of 2 (or squared); so 10cm sup.2 = 10centimeters squared. Another example, "10 sup.5" equals 10 raised to the 5th power (100,000). 2. "sub.2" refers to the number 2 appearing below the letter in front of it as seen with H2O 3. "In vitro" means that the test was made in a test tube or petri dish outside of the body. 4. "In vivo" refers to conditions inside the body. 5. "uL" = micro liters 6. "uA" = micro amperes. 7. "p" = "parts" and "<" = "greater than"
In a few places, I couldn't determine the correct number due to glare in the photo or a bad viewing angle so I had to place a question mark in parentheses (?). If you want to see the reference noted, click on the small number linked in parentheses and you'll go directly to the reference note. � Copyright 2006 Educate-Yourself.org All Rights Reserved. In 1990, the greatest discovery in the history of medicine took place, the discovery of the cure for AIDS/HIV and very other microbe caused disease on earth. They should have won the Nobel Prize, but their discovery was crushed. However, the two medical doctors involved, Kaali and Lyman, found ways to make their discovery public. They filed several patents, as did several others. While their original paper is lost to the world, in 1996 they quietly got it republished in a very obscure journal. Their discovery was the basis for the Bob Beck Protocol. I have obtained a copy of the article and am sending it to you in 5 different emails, one email for each page. Please keep these 5 files in a permanent location and let me know you got all 5 of them. The number of individuals infected by the human immunodeficiency virus type-1 (HIV) continues to increase on a world wide basis. (1) A significant percentage, if not all, of these individuals will eventually develop the acquired immunodeficiency syndromes (AIDS). (2) While horizontal transmission in the homosexual population may be contained or decreasing,(3) heterosexual transmission and infection through contaminated blood supplies continues to increase. (4) Additionally, vertical transmission from infected females to their fetuses is also on the rise with a resultant increase in the number of children with AIDS. (5) New strategies, therefore, must be devised in order to limit more effectively the spread of this virus. In this regard, three principal approaches are currently being investigated. In order to decrease susceptibility to the consequences of infection, vaccines are being sought which will induce the production of protective antibodies. (6) As treatment modalities, the use of soluble antagonists t block the receptor for HIV is being studied (7) as are pharmacologic agents such as nucleic acid analogues which can interfere with the transcription of viral genomic sequences. (8) Each of these systems has virtues and limitations, and to date none has proven completely effective. Because heat or light in combination with drugs and dyes can inactivate viruses including HIV in vitro, (9) others have suggested the use of these forms of energy to treat AIDs patients. The results of studies using heat have not been peer reviewed and are therefore impossible to evaluate. The use of light with drugs ("photopheresis") (10) appears to be efficacious, although this treatment may be limited by drug toxicity and the potential long-term effects of ultraviolet radiation on blood cell nucleic acids. Also, by its nature, this last system may not be suitable for the treatment of tissue associated virus. As a result of our interest in the use of electric current to alter biological systems, we focused our investigations on the ability of direct electrical current at biocompatible levels to alter the infectivity of HIV for susceptible CD4 positive cells in vitro. The RF strain of HIV (AIDS Reagent Program) was cryopreserved prior to treatment at -70 degrees C. For treatment, a sample of virus was thawed and maintained on ice at 4 degrees C. Ten microliters (uL) of HIV at a concentration of 10 sup.5 infectious particles per mL were placed into a chamber which included a pair of platinum electrodes 1mm apart permanently mounted into a well 1.56 mm in length and 8.32 mm in depth equal to 12.9uL volume capacity. The chamber was connected to a power supply capable of creating constant direct current. The viral aliquots were exposed to direct currents ranging form 0 micro amperes (uA) for up to 12 minutes to 100UA for up to 6 minutes. Intermediate currents of 25, 50, and 75 uA were used to expose similar viral aliquots. Under these conditions, for example, 0, 50, and 100 uA represent 0, 3.85, and 7.7 uA/mm sup.2 current densities respectively. The current was monitored throughout the experiment. A matrix of current and time employed is shown in Table 1. After the exposure of virus to electric current, the contents of the chamber were removed and placed into sterile micro tubes. Five uL of each sample were removed and diluted with 95 uL tissue culture medium supplemented with 10% fetal calf serum (FCS) for subsequent assays. This assay was performed as previously described by Nara et al. (11) Briefly, 10 sup.5 CEM-SS cells were dispensed into poly-L-lysine coated microtiter wells. Thereafter, tenfold dilutions of H9 cells incubated with the treated HIV samples were co-cultured in triplicate for up to 4 days with the CEM-SS cells. Identical wells were prepared with control uninfected and infected cells. The wells were examined for syncytium formation at 2 and 3 days and quantified using an inverted microscope. Uninfected H9 cells were pelleted at 1,000 rpm for 5 minutes at room temperature, the supernatant was decanted, and the cells were re-suspended in 100 uL treated viral sample. The cells were incubated for up to 6 hours with the viral samples. At the end of the incubation time,. the viral/cell suspensions were centrifuged at 1,000 rpm for 5 minutes and the supernatant decanted. The cell pellet was then re-suspended in 5mL of RPMI, 10% FCS and placed into a T25 tissue culture flask and maintained at 37 degrees C, 5% COsub.2 in a humidified chamber. At 2 day intervals (beginning at day 2), 1 mL of the cell suspensions was removed from each sample and centrifuged at 1,000 rpm for 5 minutes in order to pellet the cells. The supernatant was subsequently centrifuged at 14,000 rpm for 15 minutes. the pellet was resuspended in suspension buffer and assayed using standard methodology employing Mg++ as the divalent cation, poly (rA) oligo d(T) 12-18 as template primer, and tritiated thymidine (sup.3H-TdR) which comprise the reaction mixture. Known HIV positive and negative control samples were included in each assay for reference. Thirty uL of the reaction mixture were added to each 10 uL viral sample and incubated at 37 degrees C for 60 min. Samples were then incubated with 1uL of cold quench solution on ice for 15 minutes and filtered through a Millipore manifold. Chimneys were rinsed first with wash solution and followed by cold 95% ethanol. The filters were dried by vacuum and counted in scintillation fluid. Reverse transcriptase activity is expressed as counts per minute (cpm) and is considered positive only if cpm are at least five times greater than cpm obtained with HIV-negative control samples. To determine if the electric currents used were in a biocompatible range of energy, uninfected H9 cells were exposed to distinct currents for different amounts of time. The H9 cells were washed two times in Hanks Balance Salt Solution (HBSS). Thereafter, the cells were re-suspended in RPMI, 10% FCS at a concentration of 10sup.(?) cells per mL. Ten uL of the cell samples were placed into the reaction chamber. The cell samples were then exposed to 0, 50, or 100 uA for 0, 3, or 6 minutes. At the end of each test, the cell sample was removed from the chamber and approximately 10 uL of the sample was mixed with 90 uL of tyrpan blue. The number of viable cells was determined by trypan blue exclusion using a hemocytometer and light microscope. Results are expressed as percentage of viable cells from the total of all cells. At least 200 cells per field were counted. Results of the syncytium-formation and reverse transcriptase assays were tested for statistical significance by the Student's t test and analyses of variance. Using this index of HIV infectivity, it was determined that exposing virus to direct electric current suppressed its capacity to induce the formation of syncytia. Figure 1 shows a representative experiment and Table 2 shows the group data for three separate experiments. 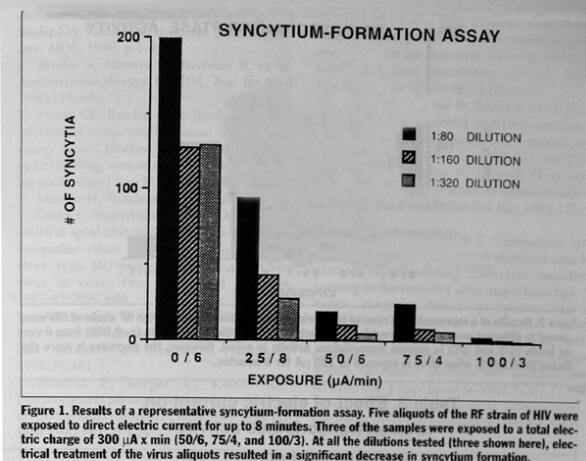 As can be noted in Figure 1, a statistically significant (p<0.001) reduction in syncytium number was observed, and this reduction was dependent upon the current applied to the viral isolate. At three different viral dilutions, there were analogous results in that a total charge of 200 uA x min (25uA for 8 minutes) reduced the number of syncytia from 50% to 65% while a charge of 300 uA x min (50uA for 6 minutes, 75 uA for 4 minutes, or 100uA for 3 minutes) resulted in 90% reduction. The direct electric currents to which HIV was exposed also reduced reverse transcriptase activity. Five separate experiments were conducted; a representative experiment is shown in Figure 2 and the group data are included in Table 3. 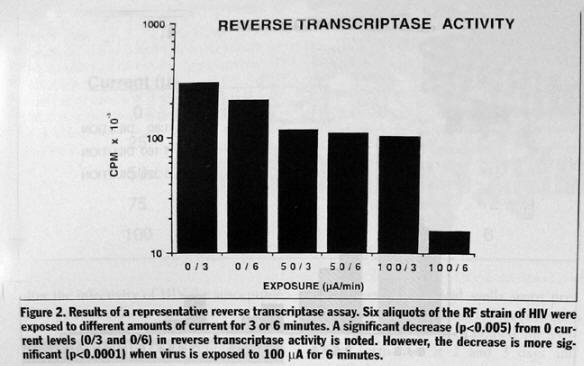 As can be seen in Figure 2, there was a significant decrease in the amount of reverse transcriptase activity after exposure of the virus to either 50 uA for 3 or 6 minutes . An equivalent reduction in reverse transcriptase activity was also noted with exposure to 100 uA for 3 minutes. and near ablation of reverse transcriptase activity was seen with exposure of the viral isolate to 100uA for 6 minutes resulted in a 94% reduction. An analysis of variance indicates that the decrease in reverse transcriptase activity was statistically significant (p<0.001). The ------(?) of a viability analysis using trypan blue exclusion criteria applied to uninfected cells exposed to the different currents and times used for these studies are shown in Table 4. The viability of H9 cells, after exposure to 100uA for either 3 or 6 minutes, did not show a significant decrease when compared to the 0 current control. After maximum treatment at 100 uA for 6 minutes, cell viability was 93% . Interestingly, in other preliminary experiments in which HIV-infected H9 cells were used, the results show that at 100 uA there may have been a significant decrease in the number of viable cells. That is, while an instantaneous pulse of 100 uA did not affect the viability of infected cells, a decrease in viability was noted at 3 and 6 minutes of exposure to 100 uA. This decrease was time-dependent in that exposure to 100 uA for 3 minutes resulted in a viability of 83% while 100 uA for 6 minutes resulted in a viability of 80%. Although theses data are provocative, they only represent a preliminary experiment and require further investigation. With respect to the possibility that the electric current was transduced into heat, the calculated rise in temperature within the chamber was determined to be less than 1 degree C. In order to verify this, a temperature microprobe was introduced into the chamber containing tissue culture medium alone. Results of these studies are shown in Table 5. Similar results were obtained when H9 cell-containing medium was placed in the reaction chamber. The data indicate that for the currents and times used for these experiments, there was no alternation in the temperature of the chamber. The results reported here demonstrate that HIV treated with direct electric currents from 50 to 100 uA has a significantly reduced infectivity for susceptible cells in vitro. This reduction of infectivity correlates with the total electric charge passing through the chamber. Although extrapolation of these data predicts that ablation of HIV infectivity may be possible, and additional preliminary data support this prediction, the expectation that some virions may still escape the electrical effect cannot be discounted. Nevertheless, the therapeutic potential of electric current may reside in its ability to lower the viral titer to sub clinical significance or in its incorporation into a strategy analogous to that of other therapies in which repeated cycles of treatment eventually achieve remission or cure. The data presented in this report are based on both quantitative and quantal determinations of viral infectivity. Although the syncytium-formation assay can be used to quantify the number of infectious viral particles, this use with respect to HIV may be abridged because of the ability of free fusigenic peptide (gp41) to induce syncytia by itself. Therefore, while syncytia were observed at some dilutions of electrically treated virus, this may simply represent the presence of soluble gp41 in the tissue culture medium. We believe that the correlation between total charge and reduction in syncytium number more adequately reflects the ability of direct electric current to reduce HIV infectivity. This belief is also supported by the results of the reverse transcriptase assays. Although a decrease in HIV reverse transcriptase does not assure reduced infectiousness of this virus for susceptible cells, we feel that, taken together with the syncytium-formation data, the results indicate that significant attenuation of HIV infectivity is achieved by treatment with direct electric currents. Rather than negative effects, exposure of cells to electric current may actually have positive consequences for resistance to infection in that important cellular electrochemical changes correlate with enhancement of specific enzymatic activities. In particular, a facilitation of succinate dehydrogenase (SDH) and ATPase activity has been observed. (12, 15) Both of these enzymes are associated with the oxidative capacity of the cell. Specifically, it has been suggested that an electrochemical reaction occurs between mitochondrial membrane-bound H+ ATPase and ADP leading to the formation of ATP. Therefore, exposure of cells to direct electric current may directly or indirectly increase energy resources within a cell and facilitate cell metabolism. This, in turn, may actually render a cell less susceptible to the effects of viral infection. In summary, the data presented here indicate that biocompatible direct electric current significantly reduces the infectivity of HIV. Continuing investigations are exploring the mechanisms through which this effect is mediated. The initial focus of these experiments is centered on the potential role which ionic and molecular species generated by electrolysis may have on the virus. However, the complete mechanism by which direct electric current attenuates HIV infectivity is undoubtedly far more complex than simple electrolysis. Nonetheless, and independent of a complete understanding of all of the mechanisms involved in the attenuation of HIV infectivity, the present observations may serve as an initial step for the development of new strategies to treat infection or prevent transmission of HIV through the treatment of the blood supply. 1. Sato PA, Chin J, Mann JM. Review of AIDS and HIV infection: global epidemiology and statistics. AIDS 1989; 3 Suppl; 1:S301-7. 2. Centers for Disease Control. Revision of the CDC surveillance case definition for acquired immunodeficiency syndrome. MMWR 1987'1 Supp 36:S1-15. 3. Thacker SB, Berkleman RI, Public health surveillance in the United States. Epidemiol Rev. 1988"10:164-90. 4. Klein RS, Friedland GH. Transmission of human immunodeficiency virus type 1 (HIV) by exposure to blood: defining the risk. Ann Int Med 1990; 113:729-30. 6. Broder S, Mitsuya H, Yarchoan R, et al. Antiretroviral therapy in AIDS. Ann Int Med 1990; 113:604-18. 7. Perno CF, Baseler MW, Broder S, et al. Infection of monocytes by human immunodeficiency virus I blocked by inhibitors of CD4-gp 120 binding, even in the presence of enhancing antibiodies. J Exp Med 1990; 171:1043-56. 8. Mitsuya, H, Weinhold KJ, Furman FA, et al. 3'- Azido-3'-deoxythymidine (BW A509U): an ativiral agent that inhibits the infectivity and cytopathic effect of human T-lymphotropic virus type III/lymphadenopathy-associated virus in vitro. Proc Natl Acad Sci USA 1985; 82:7096-100. 9. Quinnan GV, Wells MA, Wittek AE, et al. INactivation of human T-cell virus, type III by heat, chemicals and irradiation. TRansfusion 1986;26:481-3. 10. Bisaccia E, Berger C, Kainer AS. Extracorporeal photopheresis in the treatment of AIDS-related complex: a pilot sutdy. Ann Int Med 1990;113:270-75. 11. Nara PL, Hatch WC, Dunlop NM, et al. Simple, rapid quantitative, syncytiumforming microassay for the detection of human immunodeficiency virus neutralizing antibody. AIDS Res Hum Retrovirus 1987;3:283-302. 12. Cheng N, VanHoof H, Bockx E, et al. The effects of electric currents on ATP generation, protein synthesis, and membrane transport in rat skin. Clin Ortho Rel Res 1983;175:263-72. 13. Frank C, Schachar N, Dittrich D, et al. Electromagnetic stimulation of ligament healing in rabbits. Clin Ortho Rel Res 1983;175:263-72. 14. Eriksson E, Hagg,arl T. comparisom opf isometric muscle training and electrical stimulation supplementing isometric muscle training in the recovery after major knee ligament surgery. Amer J Sports Med 1979;7:169-71. 16. Pilla AA. Electrochemical information transfer at living cell membranes. Ann NY Acad Sci 1974;205:148-70. Copyright � 1996-2006 EMR Labs, LLC. All rights reserved.